← I’m going to the Zyzzyva Spring issue launch at Catherine Clark Gallery. Are you? 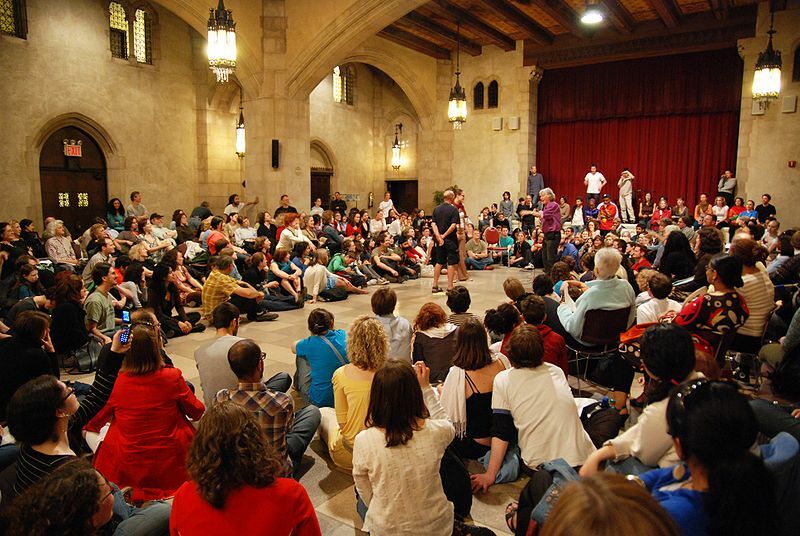 Theatre of the Oppressed is an interactive form of theatre (meaning it includes audience engagement and discussion) exploring social and political issues, founded and developed by the late Brazilian theatre practitioner and politician Augusto Boal. Detailed in his book of the same name, theatre of the oppressed is Boal’s response to theatre in the Aristotelian tradition, which he posits is designed to maintain the stability of the state and sustain the status quo. The idea is that the audience (or “spect-actors”) do not merely watch a story played out and interpret the themes on their own after the show, but can stop the performance, discuss the situations with others in the audience as well as the players, and actively divert the outcome. Sometimes, as in the case of Invisible Theatre, a story is played out in public without any indication that it is in fact a play. In Breaking Repression, the player is asked to recall a specific instance in which he felt repressed or harmed, but re-enact it while imaginatively changing his own role to more aggressively oppose the ill treatment. Theatre is often described as one of the many art forms to address current (and timeless) issues, but Theatre of the Oppressed requires imaginative, analytical, and active participation from the audience. There is no attached ideology which can be defined from the start (as in Agitprop theatre, or even the best of 20th century American socialist theatre as developed by the Group Theatre), as that will be created in situ by the collaboration between the performers and their participating audience. ST:ART Theatre is a new company in town that will be producing Theatre of the Oppressed-based shows and leading workshops. Run by artists Jessica Risco and Corine Shor, both of whom studied with Boal and have worked in ToO in the US and Africa, their first workshop is this Sunday the 15th at 10am at Intersection for the Arts. More information here. This entry was posted in classes/workshops, damn good, EVENTS, San Francisco, theatre and tagged Augusto Boal, classes, Intersection for the arts, San Francisco, theater, theatre, Theatre of the oppressed, workshops. Bookmark the permalink.